The Glen Garioch distillery in Oldmeldrum, just outside Inverurie welcomes visitors and guided tours by the brewers and the visitor centre staff are available Monday to Friday from 10am until 3:30pm. Pre booking by phone is advised. The great thing about a visit to the Glen Garioch distillery is that you go around the full production of the whisky from the malting through to the storage of the barrels. It is a working distillery so you can view whatever process is currently undergoing and smell the wonderful malty aromas associated with the whisky production. The tour is not suitable for disabled visitors because it involves walking around the distillery through some stairs and into different rooms such as the kiln room and the old malting floors. Though disabled visitors can see all this by watching the DVD in the visitor centre. The tour takes in various machinery such as the malt mill which grinds the malt to a coarse grist powder to be added with local spring water from the Percock Hills to the next stage in the production at the mash tubs. Our guide, Kenny, called this a large tub of porridge! These large tubs can be viewed if you time your tour. One of the tubs has a viewing window and the smell is wonderfully aromatic. They give off CO2 - so don't stick your nose in too far and don't breathe too deeply if you get to poke your head in for a better view - it may cause you to faint! Nothing is wasted in the production - the waste products are given to local farmers to use as cattle feed to some happy cows! Liquid waste is used as crop fertiliser. The heat from the stills are a joy to walk past in a winter's day and give off a radiant heat. A unique part of the tour at Glen Garioch distillery is the visit to the warehouse where 220 and 200 litres (55 gallon) casks are stored for a minimum of three years for blended whiskeys and 8+ years for malt whisky. Older barrels are kept on display to show how the old markings and stencillings helped the storage process by detailing information such as the date of storage. The modern barrels now have bar codes. At the end of your tour do return to the visitor centre where Jane will provide you with a wee dram of Glen Garioch 10 year old whisky to enjoy whilst sitting in some comfortable armchairs to view a DVD about the distillery history and production. The whisky tasted light and sweet with a warming floral after taste. There is a shop to purchase bottles of blended and malt whisky including the 10 and 15 year old malts and even a tempting 21 year old for whisky connoisseurs. There is also a wide range of gifts such as glasses, hot toddy mugs, water jugs, hip flasks, decanters, polo shirts, fleeces, pens and pencils. There are toilets situated in the visitor centre. 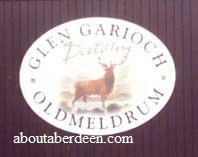 The Glen Garioch distillery was built from local Aberdeenshire granite stone in 1797 in the developing village of Old Meldrum which is now called Oldmeldrum. It was ideally situated amongst a heavily worked barley growing area. The area was a tannery until brothers John and Alexander Manson built the brewery. The distillery and brewery have since seen many owners which included Thomas Simpson in 1798 and then Ingram, Lamb and Company in 1827. In 1837 the son of the founder, John Manson Junior, purchased the site on behalf of the Strathmeldrum Distillery Company. The distillery then saw several new owners over the years. 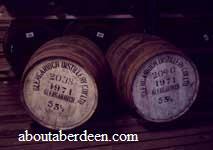 More recently it was owned by Scottish Malt Distillers from 1937 to 1968. During the Second World War production of whisky was halted and the army used some of the buildings as accommodation for the soldiers. 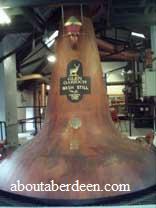 Lately the distillery was bought in 1997 by Morrison Bowmore Distillers who also produce Bowmore and Auchentoshan whisky. From Aberdeen take the A96 until it joins the A947. Continue along the A947 to Oldmeldrum. Ignore the left hand turn into the village and continue on to the third left hand turn of Distillery Road. 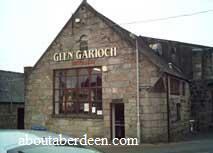 Glen Garioch distillery is at the bottom of this road. Free car parking is located on the left just before the buildings and next to the visitor centre. More distilleries in Aberdeenshire . Enjoy a splendid lunch at the nearby Meldrum Arms Hotel.